If you have a greenhouse, January is the perfect month to begin planting seeds and our outdoor gardens. It's the perfect time of year for armchair gardening -- find a comfy chair and leaf through seed and garden catalogs, planning ahead. In this issue we've included the details on the extension of our greenhouse sale and starting seeds in the greenhouse. Don't forget to send us your photos and we'll enter you into our Photo Contest. 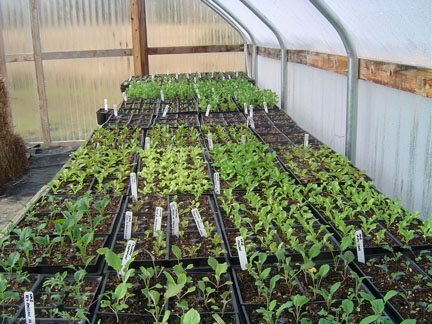 While January is the coldest month in most areas, it is also the time when seed starting begins in the greenhouse. Before planting anything, you must plan your garden. What will you be growing? How many plants will you need? How much space do you have? If growing flowers, what color scheme do you prefer? Plan for a garden that is in continuous bloom. To achieve that, what flowers will you grow? Plan for your vegetable garden and when the veggies get picked. Always be sure to follow the directions on the seed packet. Always select seeds that are disease resistant. Organize your seedling trays based on when they will germinate. Always label your seed trays so you know what is planted. Planting soil should be damp and compact. Always plant two seeds per plug. The stronger of the two will be the one that germinates. Should both seeds germinate, keep the stronger one and pull the other. For quicker germination, may seed trays can be placed into black garbage bags. This helps to hold the moisture. It is important that you seeds be kept moist and not drenched. Be sure to remove the seed trays from the plastic bag once the seeds sprout. Once the first leaves appear, follow the fertilizing guidelines for that particular plant. If planting a garden, plan for marigolds. They add a splash of bold color, attract beneficial insects to the garden while keeping destructive insects away. They also repel mosquitoes, and often last well into the fall season as they can withstand colder temperatures. Seed Growing Tip -- not sure what you should plant in January? Visit or call one of your local nurseries and ask for their advice. We would like to wish everyone health, wealth and happiness in 2012.